UNITED NATIONS, November 6 -- As the UN churns out statements attributed to Ban Ki-moon's Spokesperson Michele Montas, from topics ranging from the Congo to the World Bank, Spokesperson Montas increasing refuses to answer any questions on these topics. On Thursday Ms. Montas was asked who if anyone in the UN Secretariat, under Ban Ki-moon's control, speaks with Congolese rebel Laurent Nkunda. "You can contact... DPA," she said, using the acronym for the Department of Political Affairs. Video here, from Minute 17:30. But DPA is part of Ban's Secretariat, and its ostensible press person has never given a briefing. Why can't Ban's Spokesperson answer for the Departments that Ban controls? Similarly, when Inner City Press asked whether the UN, which routinely denounces rebel attacks in the Congo and elsewhere, can confirm or deny Nkunda's claim that the Mai Mai rebels active this week in the Kivus are armed and supported by the Congolese government of Joseph Kabila, who the UN supports, Ms. Montas said to go ask the UN Mission in the field, "you can send them an e-mail and you'll get your information." Video here, from Minute 18:50. Ironically, the UN has used Internet slow-downs in the Congo as an excuse for the growing number of UN officials who have not complied with financial disclosure rules. But what is Ban's Spokesperson's Office's job, if not to answer for units of the UN Secretariat? Worse, perhaps, when asked if the UN now has any idea the source of the deadly car bombing of its premises in Somalia, and any response to a call that the UN system more clearly distinguish non-political humanitarian work from its political support of particular factions in Somalia, as in the Congo, Ms. Montas had no answer. And of the call to distinguish humanitarian from political UN work, at least for staff members' safety, she said that "I am sure they are aware of it in our human rights office and they are working on it." But it is a, even the, major UN Safety and Security question. 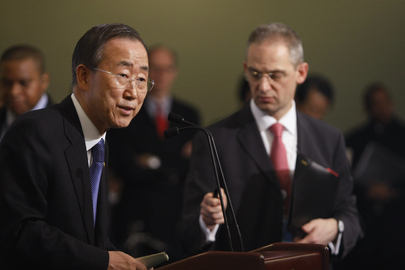 Ban Ki-moon and his Spokesperson, answers not shown, "go ask DPA"
Even questions about Ban Ki-moon's own decisions she did everything possible not to answer. Inner City Press asked her, simply to confirm or deny a report this week that Ban's envoy to Myanmar Ibrahim Gambari has been invited by the Than Shwe government to visit in the last week of November or early December. "That is an old report," Montas said, adding that Gambari will decide when to go. But does Gambari decide that alone, or with Mr. Ban? They decide together, Montas said. So wouldn't Ban and she know about, or be able to later confirm or deny, the specific invitation? Video here, from Minute 20. In fact, while Ms. Montas routinely answers questions by saying the information will be provided later, most often no information is provided. While there is more than enough news to cover in the UN building, what with the Security Council, General Assembly and agencies, that the spokesperson for the Secretariat does everything possible not to answer questions is one of the reasons that Ban has been described as "The Invisible Man." In fairness, some guess that among the causes of these problems is that Ban's Spokesperson and her Office aren't told what's going on, or are instructed to dodge. This column is written in part to try again for improvement all around. We will continue to follow these issues.